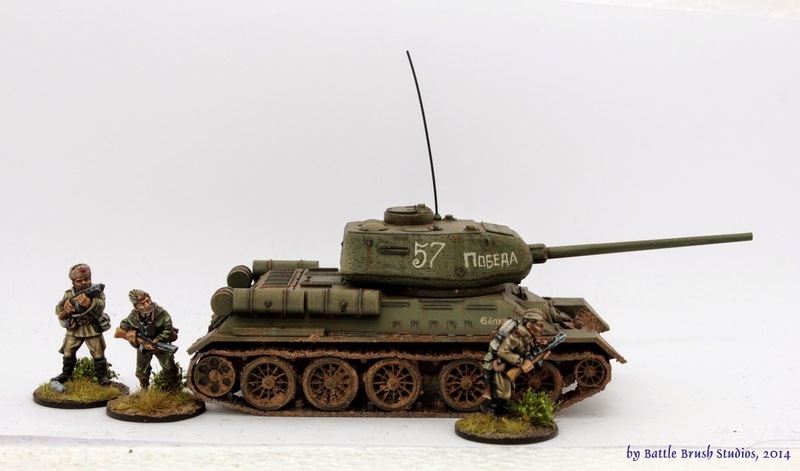 Just over a year ago Warlord Games added the Soviet T-34/85 to their small range of plastic 28mm World War Two vehicles. This tank kit is what I take a closer look at today. The T-34 surely was the most influential tank of the war. When the first version of the vehicle showed up at the Eastern front in 1941 it was a complete shock to the German army and proved to be superior to any German tank of the time. Only when the Panzer IV's later versions and the Panther came along the German army again had tanks to match the T-34. It struck the sweet spot between mobility, strength of armour and a powerful main gun. Add to this simplicity of design for easy mass production and comparatively minimal crew training and you got one of the finest pieces of engineering in military history. Of course the simplicity part also came with downsides. The optics were never up to snuff with the German quality, the crew compartments were rather uncosy even by tank standards of the time and early versions of the tank suffered from not being equipped with radio sets and only a crew of four. 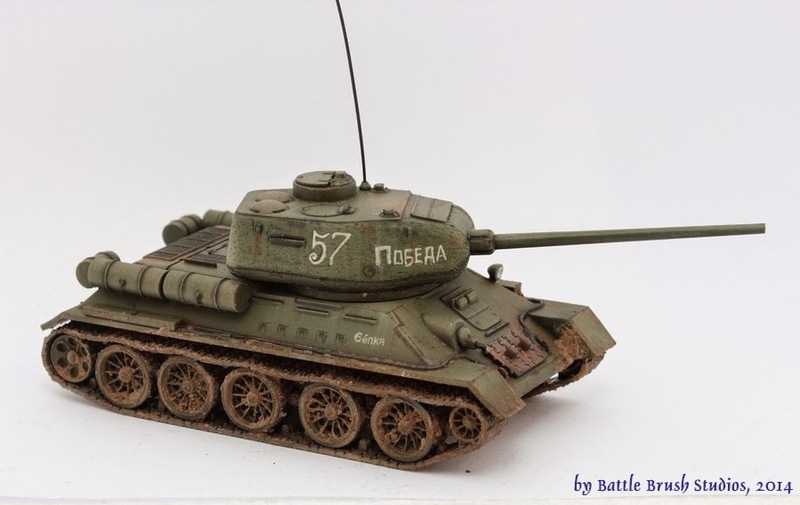 In 1944 the T-34/85 was introduced. It carried a significantly larger turret with enough room for the much more powerful 85mm ZiS-S-52 gun, a third crewman and a radio set in the turret. All whilst the hull design didn't have to be changed a great deal, frontal armour was doubled and the speed was kept at the same level. On top of that the cost of producing the T-34 tank was almost halved over the course of the war. The armour still was not quite as thick as the Panther's or the Tiger's and the gun was not quite as powerful or accurate. The fact that the Soviet war machine pumped out 54,600 T-34 tanks, 19,430 of which were T-34/85, more than made up for these shortcomings. This is more than twice the total number of battle tanks produced by Germany between 1939 and 1945. 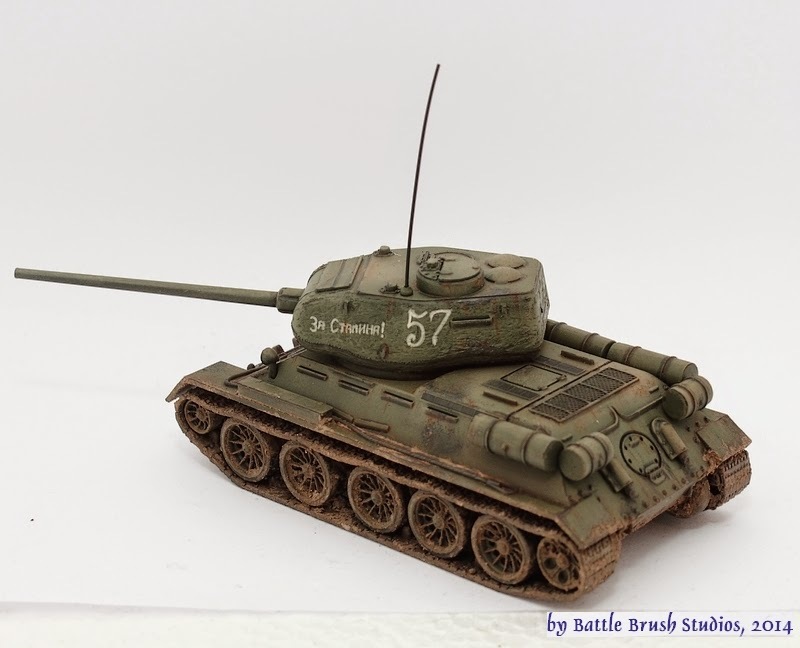 After the war the T-34/85 was the backbone of Soviet tank forces up until the 1960s. 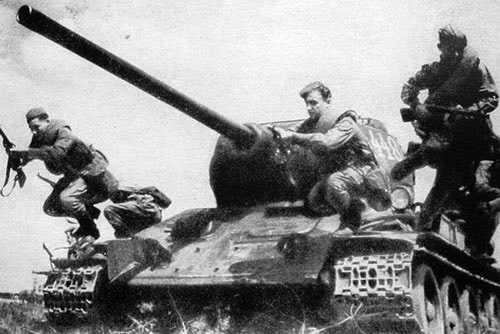 In the wars in Jugoslavia in the 1990s both sides were reported to use T-34/85. So much for the history and now on to the review. The design of the box is consistent with previous releases. It shows a photo of the model and some scenery with some heavy tinting and photoshop effects going on. In the background we can see some Warlord Games Soviet infantry and I think some Warlord Games plastic terrain. The back of the box has the usual fluff text and two pictures of different models built and painted. This is a nice touch, just showing some variants. As always, the painter is credited too and there is a reminder that there are waterslide transfers in the box as well (unlike in their resin/metal vehicle sets). The box isn't shrink-wrapped in any way, neither are the sprues. You get two sprues in the box. We can already see that the wheels are all a one part cast, the tracks interestingly are a two part cast, meeting at the front and back of the tracks. The top of the hull is a one-piece cast. 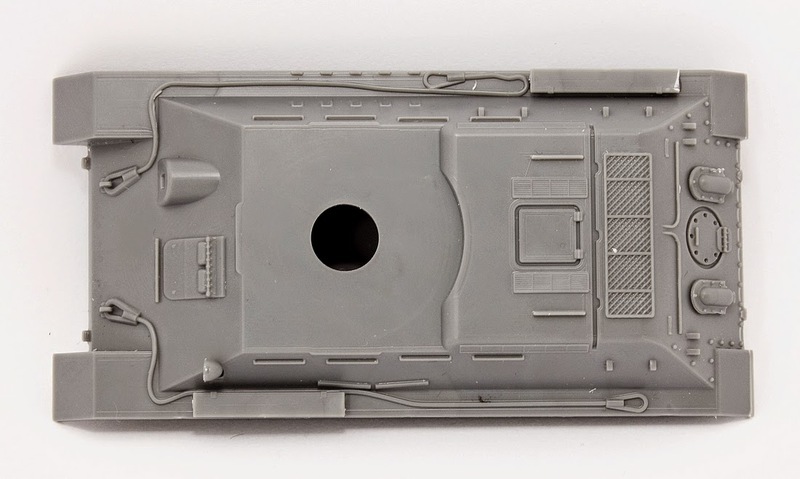 Looking at the sprues though I spotted an optional tank commander to put on the top hatch. This continues a rather interesting trend with Warlord Games and their tank models, a think I noticed about the Panzer IV Ausf.H as well: Including a tank commander but not telling anybody about it. 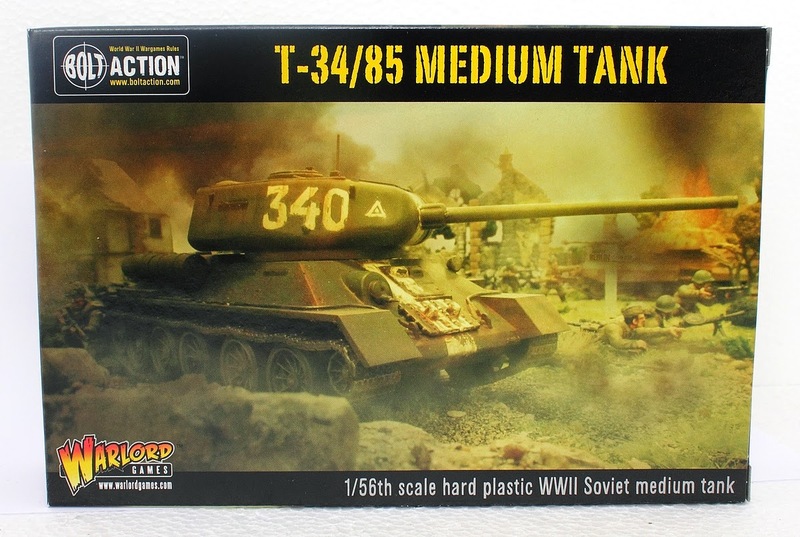 Neither the description on the website nor the box itself say anything about a tank commander being included. 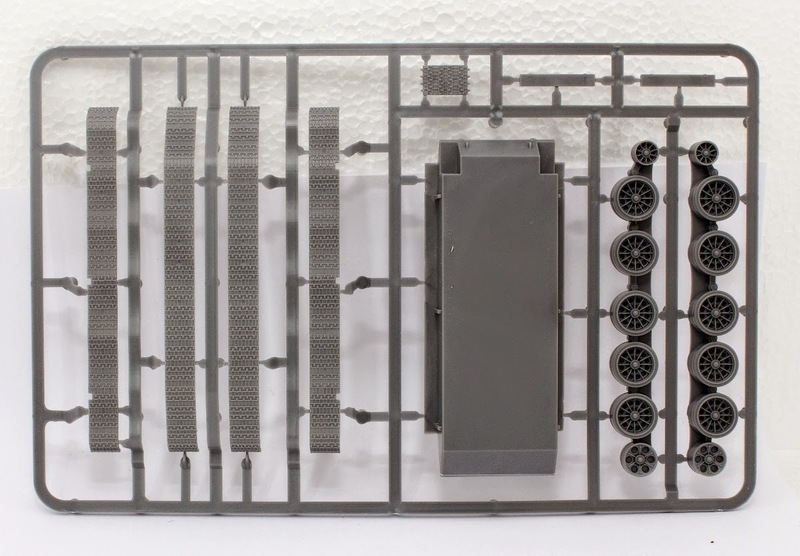 Not to say it's a nice surprise but if I had ordered seperate tank commanders and then realized there was one in the set already - like I did with the Panzer IV - I would be slightly miffed. ..with faintly visible white numbers and mottos. The decal sheet is really nicely done. 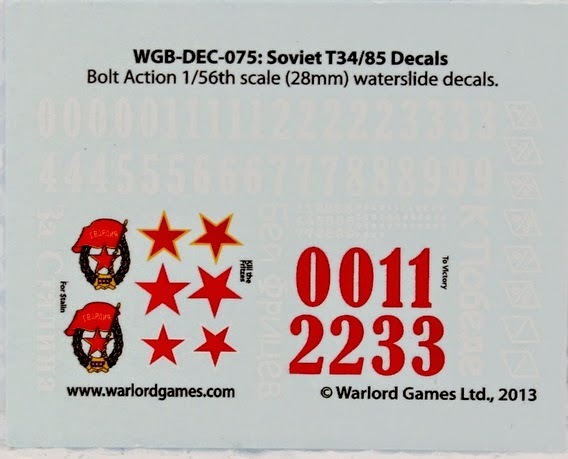 It has the full selection of numbers in white, a few in red, a bunch of red stars and extra decals for guards units. It also has the mandatory mottos in cyrillic script along with tiny translations. Very nice touch. Usually you get the mottos but translating them is left to you. The first thing I did was looking up ways for how to make the hull look nicer, add more detail and such, looking for staples to make handles, trying to remember where I put the ultra thin wire to twist together some towing cables and such. Taking a closer look at the top hull piece though made me realize that none of that was required. The detailling on the hull is rather nice for a wargaming plastic model. In the picture you can also see that the turret isn't kept in place by the old bayonet-twist mechanism like on scale models but just by a hole. You get a piece for fixing the turret in place but still be able to turn it around. I decided to just keep the turret removable for ease of painting (painting tanks with the turret on is a pain in the rear) transportation and for spectacular tank kills. The handles look fine from top and the sides but the medium is plastic after all so the lower parts would be undercuts which plastic doesn't like. If you want to go for the full proper look just file the undercut material off and you're good. I decided to just keep it as it is. What I don't like about the hull surface is the lack of weldseams which of course would be rather prominent on a T-34. Lateron I added some via plastic cement and a hobby knife. Assembly is a breeze on this one. I left the wheel parts and tracks off for now for easlier painting. The fit of the parts is excellent. I still used some rubber bands on the hull and turret to keep the single parts neatly together whilst the glue cures but that was more out of habit than necessity. This kit doesn't allow for the cannon to be elevated or lowered once it's put together. The way the pieces are made look like with some converting and a metal rod you could make it movable if you so wish. I put quite a lot of time into the weathering and whatnot. "Proper" scale modelling is quite fascinating to me. Not only because it was the first modelling I did but also because the techniques used are so different to all the Fantasy/Sci-Fi characters painting I usually do. In recent years there's been a MASSIVE influx of know-how from scale modelling into sci-fi/fantasy/wargaming of course. Some work, others don't I think. With wargaming figures you have to slightly shift the focus to sturdiness and "what will it look like on a table that's less well lit than my showcase cabinet or my painting table?" as well as proper realistic looks. As I mentioned above I added some weldseams and I subjected the turret to quite some abuse to get it to have a very rough cast iron texture. the moulds used in Soviet factories were of less refined quality than say the moulds US foundries used because there were a few million axis forces running around in their country, wrecking their stuff. 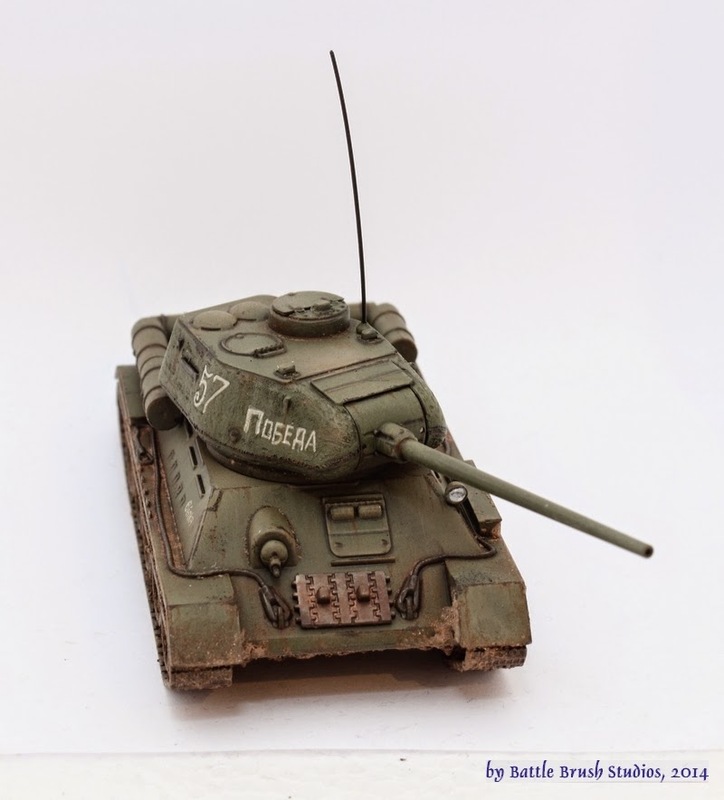 Despite the nice decals sheet I decided to paint on the markings and slogans by hand because it would look more proper on a Soviet tank. Speaking of proper things - I replaced the antenna with a piece of wire. The antenna you get in the box is reminiscent of the antennae you get in many plastic kits designed for wargaming so it's just way too short. I considered doing the old white stripe or cross on the turret but those were only really used for a very short timespan in and around the battle for Berlin so I opted for dropping that idea. Weathering tanks is fun enough. 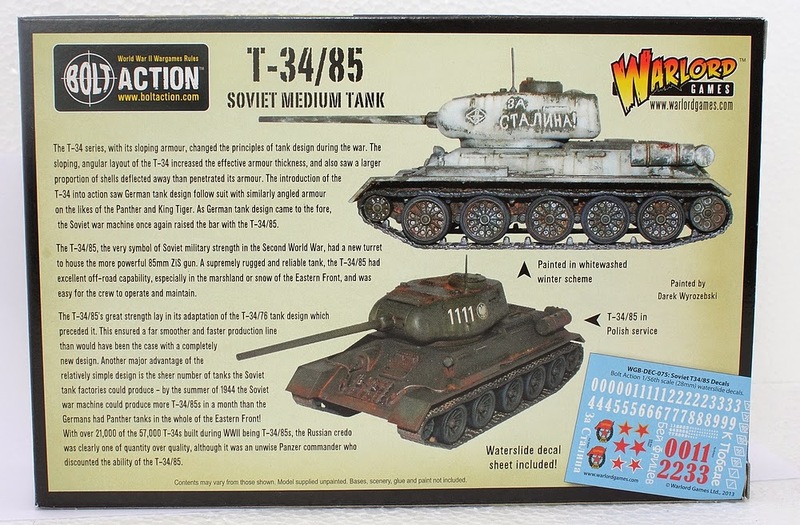 Overall the T-34/85 plastic kit by Warlord Games leaves nothing to ask for for the regular wargamer. 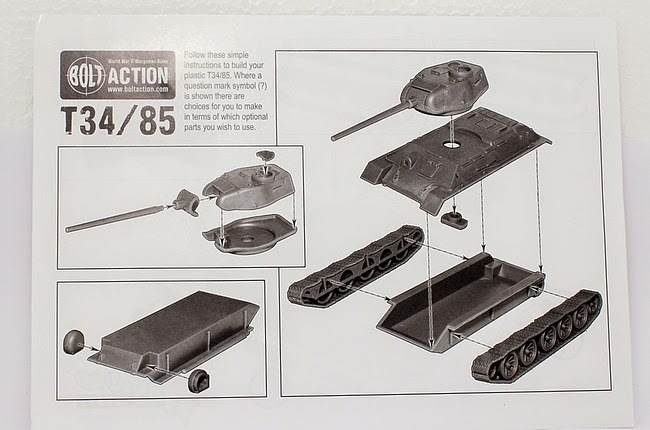 I wonder if it would have taken much effort to include a third sprue with a T-34/76 turret so you could field both versions with just getting one box. The quality of the kit is fine and nobody will have any trouble putting it together. The size of the model is spot on in terms of length and width, although it seems to be a few millimeters too tall. With a price tag of GBP 18.00 this one is right along the lines of Warlord Games' pricing. It's not cheap but then again - "who else does that in 28mm plastic?" (no, 1/48th scale does NOT qualify as fitting with 28mm figures. You know who you are. ;-) ). If you want to get your platoon some support or need your tank riders something to ride on you can barely go wrong with this kit. It's nothing fancy but you get a very solid kit with nice detailling (for a wargaming model), a commander and a hull flamer option. I hope that you enjoyed this review, found it interesting, entertaining and so on. If you have any questions, comments or indeed commission enquiries, feel free to let me know via the comments section, the Battle Brush Studios Facebook page or via e-mail. I agree with your review having built one. 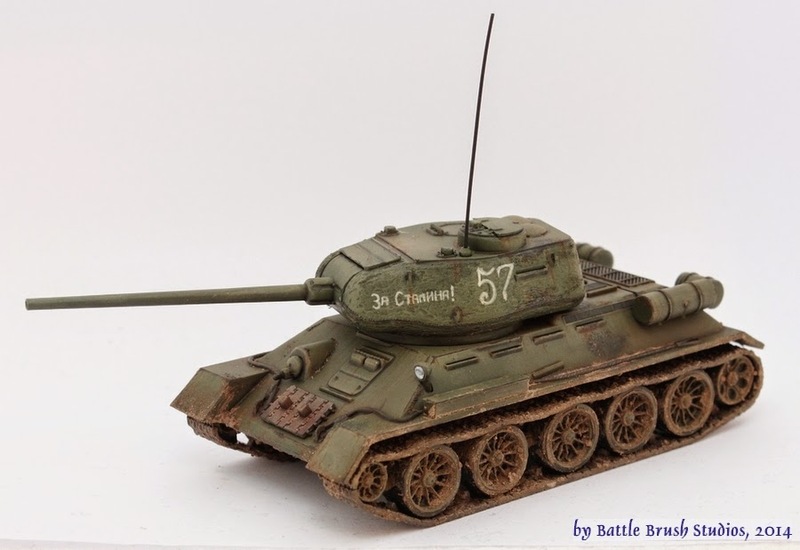 I've also built and reviewed this model and I agree with your comments http://littleleadwarriors.blogspot.ca/2014/07/in-box-warlords-156th-t34-85.html l did find that the crewman was smaller than the warlord 28mm figures.